Merlod is a modern typeface created by Kawisara Vacharaprucks and published by Stawix which is a reinterpretation of the Latin- American paintings. It is available in 3 different styles (Norme, Autre & Queue) each with 7 weights (from Thin to Black). You can mix the styles and be creative. This versatile, flexible, friendly font can be suitable for branding, display, packaging, magazine, logotype, poster, print and so on. Enjoy! 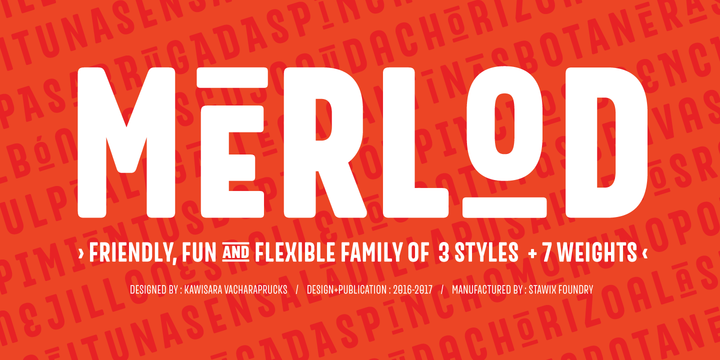 Price: starting from $30,00 for one font to $199,00 for all 21 fonts. A font description published on Wednesday, October 18th, 2017 in Fonts, Kawisarc Vacharaprucks, Stawix by Alexandra that has 2,635 views.